Learn to launch, land, and handle a sea kayak in rough water. 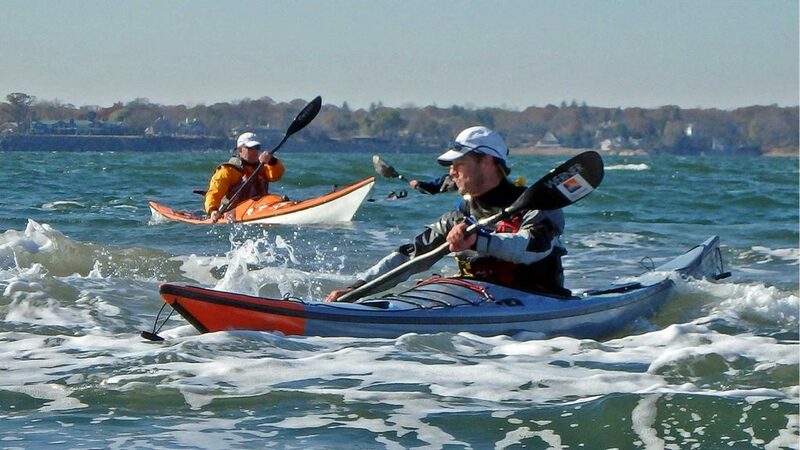 Designed for more experienced paddlers, this class focuses on the utilization of strokes, maneuvers, and body positioning for managing a sea kayak in small chop and moving water. Students will learn how to read current, time approaches, peel in, peel out, and implement braces as needed. We will provide a refresher for stern rudders, braces, edging, and high cadence paddling which are all helpful when navigating rougher water. The class will also take advantage of the shallow-slope sandy beaches near the surf zone to develop launching and landing skills in an active water environment. This offering is held on the south shore of Long Island where tidal currents, rough water, and small surf are frequently present. Having a dependable roll is highly recommended, and wearing a helmet is required. – Equipment is not included but can be rented for $50 for the half-day class.